I read this article and found it very interesting, thought it might be something for you. The article is called Maharashtra Gears Up For Drought And Elections and is located at https://archive.indiaspend.com/sectors/maharashtra-gears-up-for-drought-and-elections. 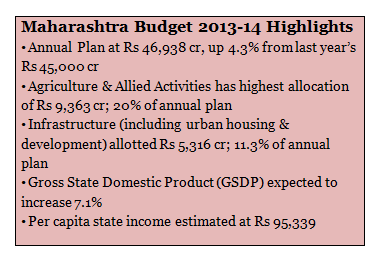 The Budget for 2013-14 would be the last for the Congress-NCP alliance in Maharashtra before the elections next year. And in a year when the state is facing an acute drought and water shortage across major districts, Budget 2013-14 has made special provisions for drought relief with an allocation of Rs 2,086 crore. The National Relief Fund has been allocated nearly Rs 1,050 crore to provide assistance for drought-affected Rabi crops. The government plans to use Rs 850 crore on temporary relief measures to tackle water scarcity and Rs 186 crore for supplying fodder. Now a look at the broad picture: Budget 2013-14 estimates revenue receipts to be Rs 1,55,987 crore and a revenue surplus of Rs 184 crore. The revised estimates for 2012-13 put the fiscal deficit at 1.43% of GSDP while the deficit is expected to increase for BE 2013-14 to 1.57%. Agriculture continues to be the prime focus of the Government with an allocation of Rs 9,363 crore. 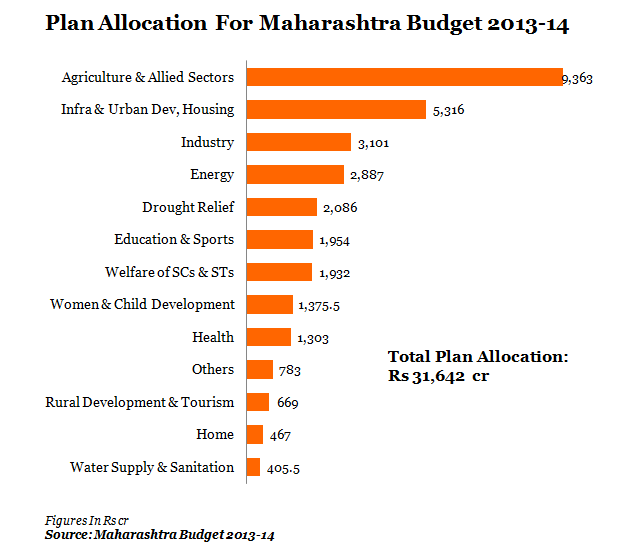 And irrigation will account for Rs 7,249 crore or 77% of the total allocation to agriculture. The government hopes to create an irrigation potential of 2 lakh hectares and complete 140 projects in 2013-14. 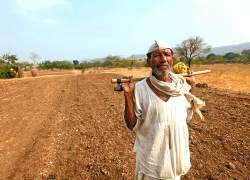 It must be pointed out that though that the Maharashtra Government has been facing flak for irregularities in expenditure on irrigation schemes. Media reports have claimed that nearly Rs 70,000 crore was spent and an irrigation potential of only 0.1% was created between 1999 and 2011. Infrastructure development has the second highest allocation in the budget with Rs 5,316 crore including Rs 1,800 crore for urban housing and development. Figure 1 (a) & (b) shows the plan allocations in the Budget this year. The plan expenditure had declined from 69.3% in 2008-09 to 63.7% in 2012-13 but seems to have increased again to 67.4% according to Budget estimates of 2013-14. 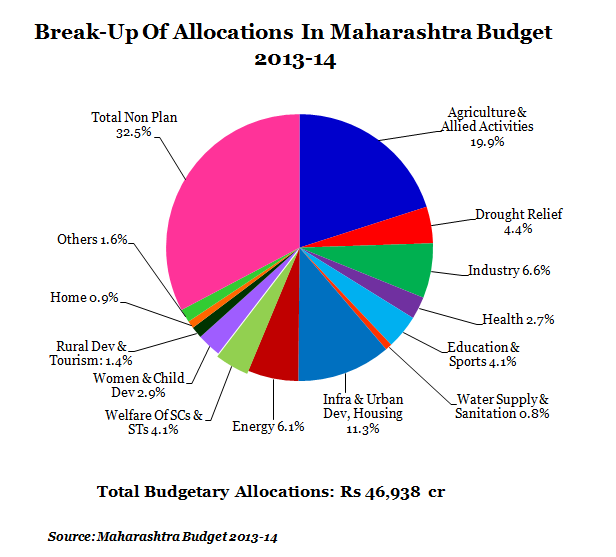 The total expenditure on welfare, health and education is Rs 6,564.6 crore, which 13.9% of the total annual plan. Salaries and pensions constitute a large part of the non-plan expenditure, and account nearly 50% of expected revenue receipts estimated at Rs 1,55,987 crore. In order to fund its social programmes, the State Government has increased taxes on lottery, liquor, cigarettes and bidis to result in a net revenue gain of Rs 1,150 crore.The tax revenue of the State has increased at an annual average of 15.6% during last seven years. The total tax receipts for 2013-14 is expected to be Rs 1,25,371 crore. a) Raising taxes on precious metals like gold and silver and precious stones from 1% to 1.10 for 2013-14.
c) Increasing taxes on paver blocks, which are widely used for road and footpath construction, from 5% to 12.5%. Maharashtra is among the well-performing states when it comes to infrastructure development, and has maintained a leading position as an industrial centre. While the State Government is focused on drought relief and agriculture (not forgetting the elections next year), it has not forgotten the urban areas. The Medium Term Fiscal Policy Strategy Statement 2013-14, released with the Budget, said the on-going drought affecting sizeable part of the state has caused huge financial burden to the state. And on the back of the limited resources availability and to expand developmental activities, it would require to keep revenue expenditure under check.